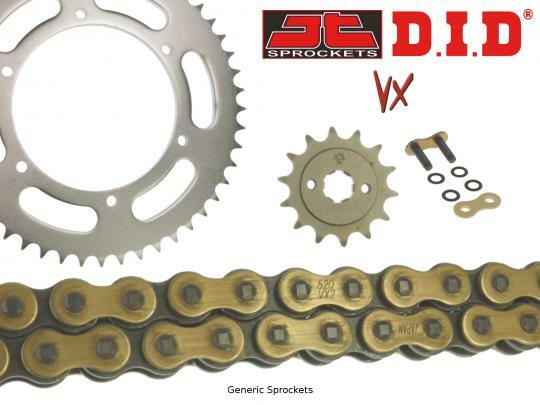 The picture below shows a DID VX Heavy Duty X-Ring Gold and Black Chain and JT Sprocket Kit. Thousands of other top quality spares listed on our website at refreshingly low prices. DID's VX Ring chain uses patented X-Ring seals. X-ring seals are superior to other types of seal because of the unique X-shaped cross section - it is better at keeping lubrication in, while also producing less friction than an O-ring seal. DID's X-ring chains have 40% greater wear resistance than DID's O-ring chain and 25 times that of the DID standard chain. With the correct maintenance, an X-ring chain will last longer than an O-ring or unsealed chain. JT is the best selling aftermarket sprocket in the world. Using the finest raw materials and cutting-edge technology in production, CNC computer design and precision machining, JT ensures maximum durability and performance. JT front sprockets are made with SCM420 chromoly steel alloy, while the rear sprocket is manufactured with ultra-durable high-carbon C49 steel. DID 520 VX drive chains are always supplied 'open' with a rivet link (included). You will need a specialised tool in order to rivet the chain, or take it to a mechanic who can do it for you. A spring link is available, but a spring link has only 65% of the strength of a rivet link and therefore, a rivet link is always recommended. It is important to periodically inspect and lubricate the chain to maximise chain life.